From May 22nd through June 20th, Schoenbrunn, Lotte Hotel Seoul's exquisite Continental Restaurant presents a "World Celebrities' Luncheon" featuring superb menus preferred by world celebrities in commemoration of the opening of a new lobby on the 14th floor of Lotte Hotel Seoul's notable New Wing. During the period, 6 selected menus favored by world celebrities and VIPs who have stayed at Lotte Hotel Seoul will be offered in 4-course set menus that include appetizer, main dish, dessert and espresso. The selected appetizers and main dishes include 'Tuna Tartar,' a favorite of Mr. Kofi Annan, Secretary General of the UN, ‘Organic Salad' as preferred by British Artist, Ms. Alison Lapper, ‘Korean Beef Steak' as enjoyed by Mr. Guus Hidink, world famous World Cup soccer coach, and ‘Grilled Lamb Chop' as ordered by his Royal Majesty King Abdullah bin Abdul Aziz al-Saud, who was Crown Prince of Saudi Arabia when last he stayed at Lotte Hotel Seoul. The commemorative "World Celebrities' Luncheon" menu was developed and prepared by Michelin Star Chef, Sylvain Dubreau, a native of France and purveyor of authentic French cuisine, who was inspired on this important occasion by the many VIPs and notables who have chosen Lotte Hotel Seoul as their hotel of choice when in Korea. The menus are rounded out with ‘Yogurt Mousse' as preferred by French actress Sophie Marceau, and complemented by rich ‘Espresso' as preferred by H.E. Lula da Silva, President of Brazil. 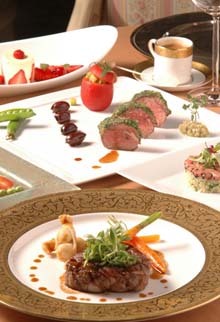 The featured menus are priced at 58,000won to 65,000won, not including VAT or Service Charge. Schoenbrunn Continental Restaurant, located on the 35th floor of the New Wing at Lotte Hotel Seoul downtown is a deluxe continental restaurant boasting the elegance and dignity of a traditional European palace. With a breathtaking view of downtown Seoul, Schoenbrunn is the right place to enjoy refined cuisines and wines in a totally elegant atmosphere.